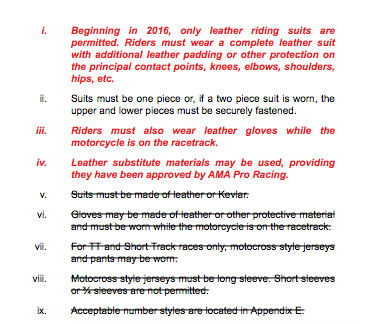 The new technical rulebook for the 2016 AMA Pro Racing GNC season was released on New Year's Eve. As we've known for a while, the proposed rule of making the GNC1 class exclusively race twins at all rounds (not singles and twins as is currently the rule) has been postponed for at least one year, coming into force in 2017 at the earliest. So there are very few changes for this year, except that all riders are now forced to wear leathers (see the page above) at all rounds. At present 99% choose to wear motocross gear for short track and TT races. Riders must wear leather gloves too. I've seen a lot of riders wear MX fabric gloves with leathers, for increased feel, so it might bother a few people, but Rossi doesn't seem to lack feel with leather gloves, so I'm sure they'll get over it. The reason for the new leather rule, it seems to me, is to re-establish flat track's strong identity, and nothing to do with safety. It's a low cost roll of the dice. A few riders might miss out on low-level sponsorship from MX clothing companies, but from the little I know it would be very small sponsorship figures and more likely, for most riders, nothing more than free kit, thought I know every little helps and very few riders are making a decent living from flat track racing so free kit would be welcomed. If you were a glass half-full kind of person you'd say that this new rule would give riders a chance to approach leather manufacturers with a new vigour, leathers are going to be a talking point. And there are dozens of manufacturers, big and small. If the rule allows for kevlar as well, then no racer is going to accept the weight deficit of a set of leathers. AMA st and tt isn't going to look like mx any more, its going to look like speedway instead. If you look on the page I grabbed from the rules, it shows that there was a proposed rule for kevlar suits, but it has been scored through and disregarded. I don't think motocross gear or leathers or kevlars alone make flat track look like another bike sport, but DTX bikes plus MX gear, that some riders change colours from practice to racing at the same event, and from race to race, means they lack a recognisable identity. So I get your point but, in my opinion, kevlars probably wouldn't make flat trackers look like speedway riders because the bikes are so different to speedway bikes. Especially if the kevlars were designed to look more like traditional flat track leathers. If the AMA is concerned about flat track's identity, they should start with banning front fenders and requiring Class C front number plates for the DTX bikes.